Khichan Bird Sanctuary is located at a distace of 171 kms from Jaisalmer city in the village of Khichan. This natural sanctuary serves as home to three types of birds called Kurjan, Karkara and Kunch that migrate from South West Europe, Black Sea region, Poland, Ukraine, Kazakhstan, North and South Africa and Mongolia. These birds can be seen in large numbers at this bird sanctuary between October and March as they migrate to India during this time to avoid the cold winters of Europe. Khichan Bird Sanctuary is popular world wide as the Demoiselle Crane village. A large number of these birds visit India every year, however, only about four to six thousand come to the bird sanctuary at Khichan. Kurjan, which makes a typical ‘kur-kur’ sound, weighs 4 to 6 kg and has a height of about three feet. It is for the typical sound they make that they are called Kurjan in the local language. The bird is capable of flying long distances at speeds varying from 40-60 km per hour. Although Kurjans have typical features which make their appearance quite attractive. By Road: Khichan Bird Sanctuary is located at the outskirts of Khichan town. One can easily reach here by taxi or by walk. By Rail: Khichan Bird Sanctuary is well connected through nearest Phalodi Railway station (	6 km) to major cities railway stations like Delhi, Agra, Mumbai, Chennai, Ajmer, Pali, Jaipur, Ahmedabad. 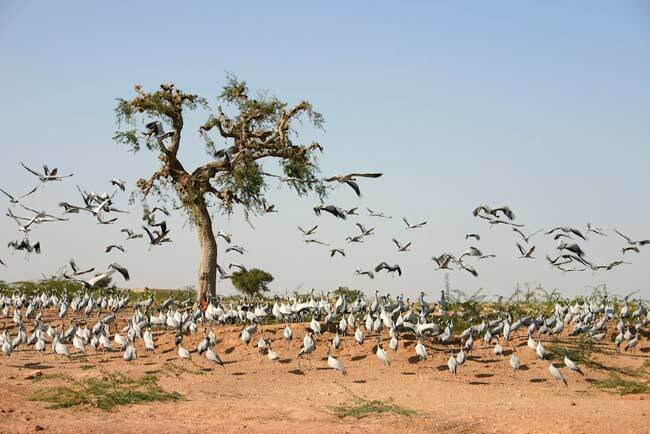 By Air: Khichan Bird Sanctuary can be reach through nearest Jodhpur Airport (143 Km) which is well connected with regular domestic flights to Delhi, Mumbai.